Synthetic peptide within Mouse VCAM1. The exact sequence is proprietary. 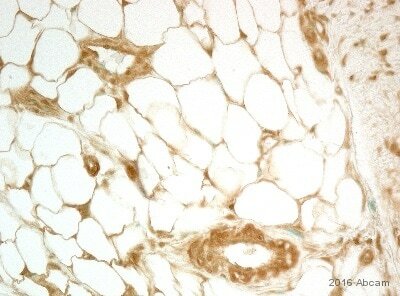 IHC-P: Human spleen and tonsil tissue; Mouse spleen tissue. WB: Mouse kidney, brain and spleen lysate; Rat brain, spleen and kidney lysate; Human fetal liver lysate; NIH/3T3 and HuT-78 cell lysate. Flow Cyt: K562 cells. ICC/IF: K562 cells. IP: Human fetal liver lysate. Our RabMAb® technology is a patented hybridoma-based technology for making rabbit monoclonal antibodies. For details on our patents, please refer to RabMab® patents. We are constantly working hard to ensure we provide our customers with best in class antibodies. As a result of this work we are pleased to now offer this antibody in purified format. We are in the process of updating our datasheets. The purified format is designated 'PUR' on our product labels. If you have any questions regarding this update, please contact our Scientific Support team. This product is a recombinant rabbit monoclonal antibody. Shipped at 4°C. Store at +4°C short term (1-2 weeks). Upon delivery aliquot. Store at -20°C. Stable for 12 months at -20°C. Our Abpromise guarantee covers the use of ab134047 in the following tested applications. WB 1/2000 - 1/10000. Detects a band of approximately 100 kDa (predicted molecular weight: 81 kDa).Can be blocked with VCAM1 peptide (ab156177). See IHC antigen retrieval protocol. Important in cell-cell recognition. 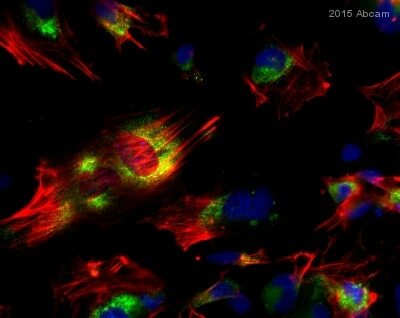 Appears to function in leukocyte-endothelial cell adhesion. Interacts with the beta-1 integrin VLA4 on leukocytes, and mediates both adhesion and signal transduction. The VCAM1/VLA4 interaction may play a pathophysiologic role both in immune responses and in leukocyte emigration to sites of inflammation. Expressed on inflammed vascular endothelium, as well as on macrophage-like and dendritic cell types in both normal and inflammed tissue. Contains 7 Ig-like C2-type (immunoglobulin-like) domains. Either the first or the fourth Ig-like C2-type domain is required for VLA4-dependent cell adhesion. Immunohistochemical staining of paraffin embedded human tonsil with purified ab134047 at a dilution of 1/500. A pre-diluted HRP polymer for rabbit/mouse IgG was used as the secondary antibody and the sample was counter-stained with hematoxylin. Antigen retrieval was perfomed using Tris-EDTA buffer, pH 9.0. PBS was used instead of the primary antibody as the negative control, and is shown in the inset. 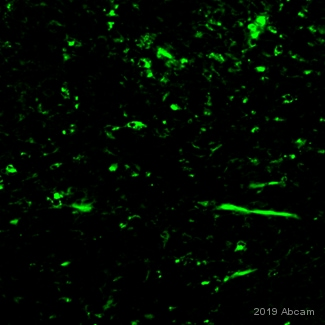 Immunofluorescent staining of K562 cells (fixed in 4% PFA, permeabilized with 0.1% Triton X 100) using purified ab134047 at a dilution of 1/250. 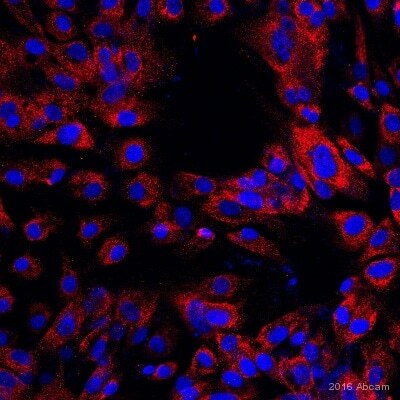 An Alexa Fluor® 488 goat anti-rabbit antibody was used as the secondary at a dilution of 1/500 and the cells were counter stained with DAPI. The negative control is shown in the bottom right hand panel - for the negative control, Alex Fluor® 594 goat anti-mouse was used at a dilution of 1/500. Flow Cytometry analysis of K562 (human chronic myelogenous leukemia) cells labeling VCAM1 with purified ab134047 at 1/40 dilution (10ug/mL) (red). Cells were fixed with 4% paraformaldehyde and permeabilised with 90% methanol. A Goat anti rabbit IgG (Alexa Fluor®488) at 1/2000 dilution was used as the secondary antibody. Rabbit monoclonal IgG (Black) was used as the isotype control, cells without incubation with primary antibody and secondary antibody (Blue) was used as the unlabeled control. VCAM1 was immunoprecipitated from Human fetal liver lysate with ab134047 at 1/110 dilution. Western blot was performed from the immunoprecipitate using ab134047 at 1/1000 dilution. 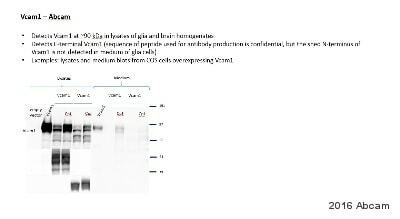 VeriBlot for IP secondary antibody (Peroxidase conjugated),was used as secondary antibody at 1/1000 dilution. IHC image of VCAM1 staining in Human spleen formalin fixed paraffin embedded tissue section, performed on a Leica Bond system using the standard protocol F. The section was pre-treated using heat mediated antigen retrieval with sodium citrate buffer (pH6, epitope retrieval solution 1) for 20 mins. The section was then incubated with unpurified ab134047, 1/200 dilution, for 15 mins at room temperature and detected using an HRP conjugated compact polymer system. DAB was used as the chromogen. The section was then counterstained with haematoxylin and mounted with DPX. Observed band size: 100 kDa why is the actual band size different from the predicted? Lysates/proteins at 10 µg per lane. I'd like to know from which IgG isotype is this antibody? Anti-VCAM1 antibody [EPR5047] (ab134047) is a rabbit IgG. Unlike mice, rabbits have only one IgG subclass. Is this antibody detecting at ˜100 kDa (as opposed to the predicted mw of ˜81 kDa) due to glycolsylation? I agree that the reason for the ˜100 kDa band is that the VCAM1 is a glycoprotein, so the actual band size detected by the antibody is higher than the theoretical size. Merci de nous avoir contactés. La séquence immunogène d’ab134047 est xxxxxxx qui correspond aux acides aminés xxxxxxxxx de la région C-terminale de la protéine chez la souris. Cependant, cette séquence immunogène est confidentielle. Par conséquent, s'il vous plaît ne la partager pas ou ne la publier pas. Cette information est strictement pour votre usage personnel. Je vous envoie également un devis pour cet anticorps dans un email à suivre. J'espère que ces informations vous seront utiles. N'hésitez pas à nous contacter de nouveau si vous avez d'autres questions. Vous utilisez nos produits? Partagez vos résultats sous forme d'Abreview et recevez en échange des CADEAUX!